Set your MySQL ‘root’ password before executing the script below. If for some reason you don’t remember your MySQL password, then you can easily reset your MySQL ‘root’ password as described here. NOTE: Keep in mind that you need to have a domain name registered and pointing to your server’s IP address before installing WordPress, or else this script will not work. This is the script, you will need to open up your favorite text editor, copy and paste this script into your editor, and save it with a name of your choice. echo -n "Enter your MySQL root password: "
echo "Database created. Starting installation!" echo "Continue your installation at http://www.$wordurl/wp-admin/install.php"
The script will then ask you for information to create a MySQL database for your WordPress installation, after which it then downloads, installs, and configures your installation to work with your database. Finally, it creates a virtual host with which your WordPress installation will be served to a web browser. Altogether, this should take no more than a few minutes to set up and run. 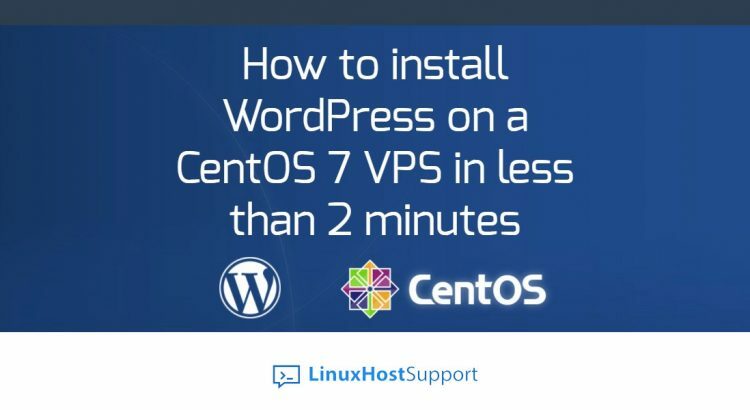 Now that you have successfully installed WordPress on your server, the last thing you’ll need to do is to navigate to http://<yourwebsitehere>.com/wp-admin/install.php and finish configuring your WordPress installation. Of course, you don’t have to do any of this if you use one of our Linux Host Support services, in which case you can simply ask our expert Linux admins to install this for you. They are available 24×7 and will take care of your request immediately.